The seventeenth century in England had a lot going on. First there was the English Civil Wars where brother fought brother over the division between King and Parliament. Secondly, there was the Plague. And then there was the Great Fire of London. All of these events took a massive toll on human life. 84,830 men were killed in the Civil Wars, 70,000 more died in the Plague. 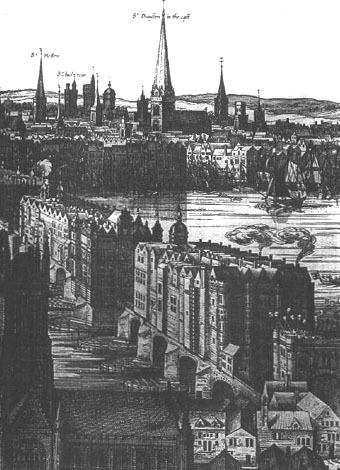 The Great Fire of London destroyed most of the familiar old Tudor streets. What’s more, the beheading of King Charles I had a huge impact on England’s psyche. There was a sense that the governance of England hung in the balance – that the old order was subject to change, and that nothing could be relied upon. It is hardly surprising that at this time, astrologers predicted doom and destruction to come. Yet the period just after King Charles II was restored to the throne, known as the Restoration period, was one of unrestrained celebration and entertainment. There was a mere five years between 1660, when Charles arrived back in London to fanfares and jubilation, until June 1665 when the first impact of the Plague deaths hit London. I was fascinated to write about this period, a time eclipsed by the bigger events of the century, sandwiched in between the dark days of Cromwell and his Puritan rule, and the dread disease that ravaged the country. This was the time where I set my novel, The Gilded Lily – a time of surface optimism, but with undertones of unease beneath. The two sisters, Ella and Sadie Appleby, on the run from the Law, escape their rural village hoping for a new and better life in London. This was a quite different London from Tudor London where the Queen aimed for political expansion and gripped the nation with a firm hand. Very much as London in the 1960’s was known as the “Swinging Sixties” and heralded a new era of sexual exploration, 1660’s London was a city of new fashions, of theatres, entertainment, lavish food and a renewed moral freedom. The King gathered his “Merry Gang” around him, the wits, the rakes, the young bloods, such as Buckingham and Rochester. Their sexual exploits fueled the gossip of the nation, as Charles went through no less than thirteen royal mistresses, and probably a few more undocumented liaisons besides. 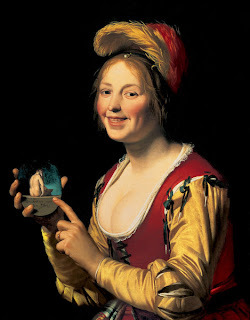 Men dressed like peacocks in ribbons and bows, women’s décolletage drifted ever lower. An actress like Nell Gwynn could come from nothing yet make her fortune at court. 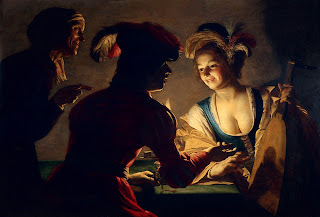 In The Gilded Lily, Ella, the bolder sister, has her sights set firmly upward on handsome Jay Whitgift, the son of a pawnbroker, who in turn is fixed on moving upwards to enter the coterie at Court and buying himself a baronetcy. 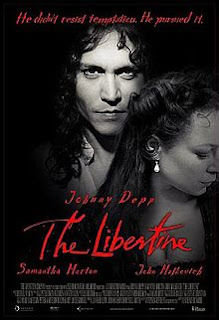 If you have seen the film, The Libertine, with Johnny Depp, this is the sort of society in which Jay Whitgift moves, and to which Ella aspires. I modelled Ella partly on paintings by Gerrrit Von Honthorst, a 17th century Dutch artist, who painted Courtesans and women of the lower classes with clarity and detail. Sadie, the more timid sister, finds the size of London terrifying. London in these times is owned by the young – many older people lost their lives in the Wars, there is a feeling that life is short. Death by burning is the penalty for those, who like Sadie and Ella, have stolen from their employer. Writing the story through Ella and Sadie’s viewpoints was eye-opening. In an age of conspicuous wealth there is always the flip-side, and Restoration London is no exception. Poverty and the accompanying criminal underworld lurk just beneath the surface, and I enjoyed researching these. London is well-documented at this time, and I spent much time poring over old maps to find where they might have lived. Blackraven Alley, where I placed their lodgings, was later destroyed by the Great Fire of London. I encourage anyone interested in this period to explore a little further by reading: The Darling Strumpet by Gillian Bagwell – a lovely account of the life of Nell Gwyn, The Apothecary’s Daughter by Charlotte Betts or Year of Wonders by Geraldine Green, two very different books about the Plague, As Meat Loves Salt by Maria McCann about the English Civil Wars, and Restoration by Rose Tremain - insights into Charles II and his court. Please feel free to add to my list! 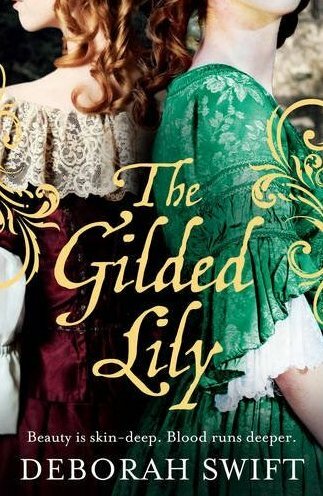 The Gilded Lily is out now in the UK in paperback and ebook – coming soon as a Reading Group edition in the US. Stop by tomorrow to read my review of The Gilded Lily. Love when authors share the background of their books - and thanks for all of the other book suggestions! Hi Lisa, thanks for commenting on my post. Deborah,I thoroughly enjoyed your post and can't wait til "The Gilded Lily" comes out! So glad you mentioned "The Apothecary's Daughter" by Charlotte Betts as it was one of my favorite books of last year. I recently bought a copy of the sequel "The Painter's Apprentice" and look forward to that one too.